The capacity-building workshop for the Equator Prize for Sustainable Land Management in Sub-Saharan Africa winners was held at the Kenya School of Monetary Studies. Eileen de Ravin, Manager of the Equator Initiative, delivered the opening remarks. She then introduced the facilitators, Ms. Esther Maura and Mr. David Kurria, after a short video on the Equator Initiative. 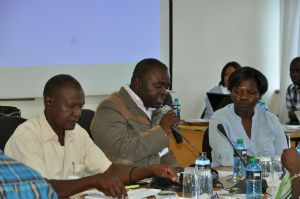 This session laid the platform for engagement among the participants and introduced the work of the Equator Initiative. 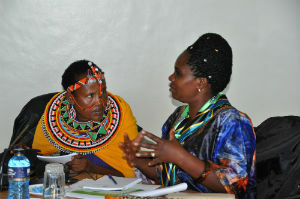 Esther Mwaura, lead facilitator, prompted the participants to introduce one another. Each participant was given an opportunity to share what he or she did, and what inspired him or her to do that work. 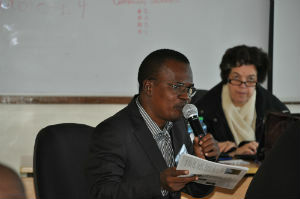 Introductions were followed by an overview of the workshop's program. The primary objective of the program was to share knowledge among peers; the second was to celebrate best local sustainable development practices in dryland ecosystems in sub-Saharan Africa. David Kuria, CEO and founder of past Equator Prize-winning initiative Kijabe Environment Volunteers (KENVO) , from Kenya, outlined the research, partnership building, and community building undertaken at KENVO, as well as the organizational and management challenges as CEO; Mr. Kuria also expressed his admiration for the talent and the work of the people present at the workshop. Damtote Sambieni, one of the participants from Togo, discussed the serious water problems in her community and their adverse effects on women: as women in her village are charged with collecting water. Ms. Sambieni also explained how she got involved in tree-planting (through her organization), as a way to increase water retention, to provide a source of firewood for her community, and to rehabilitate their land. In a similar vein, participants from different countries continued to introduce themselves, talking about their career paths and about the impact of their work. Ms. Maura concluded the session asking everybody to think about the importance of community efforts, not only in sustaining protected areas and drylands but, moreover, in promoting the sustainable use of natural resources in the region. The responses to this question would prompt the second session of the day. 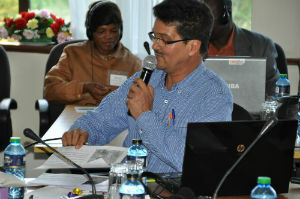 David Kurria, former Equator Prize winner from Kenya, facilitated the second session in which participants revisited the Equator Initiative’s twelve-year journey. 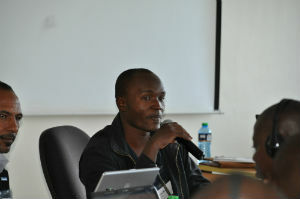 Mr. Kuria explained how his group was nominated three times for the Equator Prize, before winning on the fourth try. He credited his win to his team's dedication and his initiative's continuous improvement. Eileen De Ravin summarized the history of the Equator Prize (since its inception in 2002), talked about the Equator Initiative partners, as well as the mission and vision behind the Equator Initiative partnership. She highlighted the importance of the winners’ case studies (found in the Equator Initiative website) and their use in academia. She noted that the translations of the case studies into local languages had expanded the Equator Initiative’s reach, helping non-English speakers to benefit from the case studies; 20,000 downloads of case studies have been recorded to date. Ms. De Ravin also stressed the importance of keeping in touch with the Equator Initiatives’ social media pages to stay connected and receive updates about future Equator Initiative events. Frank Msafiri from SusWatch Kenya explained the importance of documenting best practices from civil society and grassroots groups: such as those coming from Equator Prize winners. He talked about using media effectively to raise public awareness on best environment practices and to secure donor funding for replication of initiatives. He also mentioned that the United Nations Convention to Combat Desertification (UNCCD) was partnering with the Equator Initiative to empower local communities to better engage with policy makers regarding sustainable land management practices in their respective countries. Mr. Msafiri concluded by reiterating the need for publications that provide facts and influence the policy making process. James Kasoo, representing Il Ngwesi Group Ranch (Equator Prize 2002 winner), explained how the Prize had been instrumental to their marketing efforts. The Prize had opened a wide range of funding opportunities and facilitated the implementation of women empowerment projects. Mr. Kasoo also highligted other achievements of his organization including receiving 5 million Kenyan shillings as micro-credit, and Il Ngwesi's conservation efforts: taking people closer to nature. Esther Maura, one of the facilitators, emphasized the importance of the Equator Initiative's community dialogues as a platform for the exchange of knowledge and best practices among Equator Prize winners around the world. Ms. Maura also reiterated the value of such initiatives towards the achievement of the Millennium Development Goals. Kennedy Onyango, Equator Prize 2010 winner, explained how he belonged to an association that promotes community-based management of local water resources. Winning the Prize provided local and international recognition to the association and its work. The session concluded with questions from the audience that focused on how the prize money was utilized by previous Equator Prize winners and its effects on previous winner's organizations. Most of the winners from previous cycles mentioned that funds from the Equator Prize were reinvested in the organization to develop infrastructure. 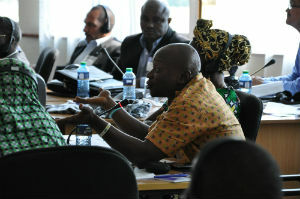 At the beginning of this session, the Equator Prize for SLM winners were introduced to the concept of “elevator pitch”. Participants were briefed about methods for summarizing and effectively conveying information about a project/initiative to potential donors. They were then asked to present their work using an "elevator pitch". Participants presented the strategies they employ for sustainable land management in Togo, Chad, Burkina Faso, Niger, Ghana and South Africa. Each presenter talked about the strategies used, the lessons learned, and the impact of their activities. Presentations touched upon an assortment of themes including food security, disaster risk management, and smallholder agriculture. All presentations highlighted the importance of proper ecosystem management. The participants also discussed the various quantitative and qualitative impacts of their activities. Quantitative impacts included the number of people benefited through a given activity, the number of trees planted, or acres of land restored. The qualitative impacts included social changes, such as improvements in farming or water management techniques. 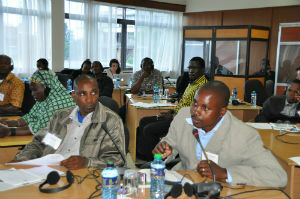 The strategies each participant employed to tackle land degradation varied greatly. 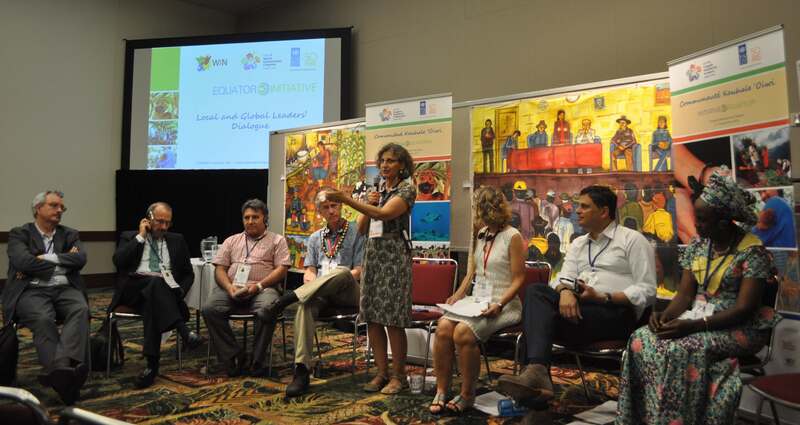 And although awareness-raising programs were one of the common strategies used by the winning initiatives to share their knowledge, participants also held capacity building workshops, organized fair trades, and created platforms to discuss key land management issues with experts. 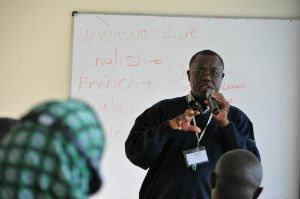 During this session, participants had the opportunity to learn from each other and to suggest areas of improvement to one another.The dialogue between the participants helped strengthen their capacities, and made them cognizant of the Millennium Development Goals, including the relation to their work and to donor countries' priorities. This session comprised of presentations by Equator Prize for Sustainable Land Management in Sub-Saharan Africa winners from Tanzania, Zambia, Swaziland, Kenya and Benin. The presentation themes included resource management, eco-tourism, sustainable energy, agro-diversity management, ecosystem management, food security and water security. The strategies employed by the Equator Prize winners to promote sustainable land management in their region included the use of village banks with social funds, ecosystem mapping, ecotourism, energy saving stoves, and sand dams. One presenter’s strategy focused on women's empowerment through financial inclusion, with over 200 women participating in the village bank savings scheme. Another presenter revealed the completion of 1,573 sand dams, which facilitated the planting of 1,570,000 trees. Other participants' stategies aimed at advancing trade and infrastructure development in their regions. 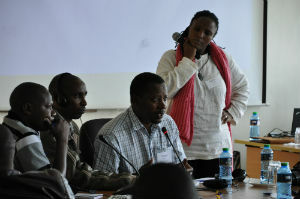 As the session concluded, the facilitators recapped the day's highlights. Sand dams generated much interest among the participants, many of whom wanted more information about such projects.The elevator pitch was warmly welcomed as a new tool, and participants were enthusiastic to learn and practice it.The participation of women at the conference was praised; participants wished that the representation of women will be further increased in upcoming events. Lastly, the workshop participants were inspired by the different projects discussed during the day. Such projects generated optimism and hope for the future: hope that desertification can be reversed.